Product #60798 | SKU LSDMI512BB-633A | 0.0 (no ratings yet) Thanks for your rating! 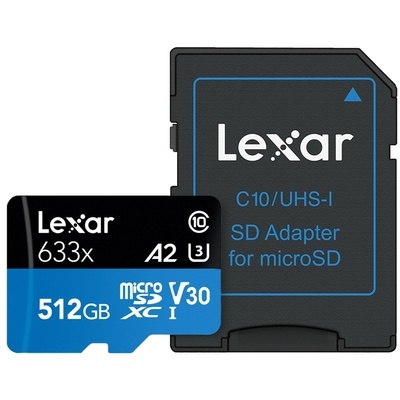 Designed for your sports camcorder, tablet, or smartphone, Lexar 512GB 633x UHS-I microSDXC Memory Card with SD Adapter lets you quickly capture, playback, and transfer a large number of multimedia files, including 1080p Full-HD, 3D, and 4K video. These Class 10 cards leverage UHS-I technology to deliver high-speed performance. Includes SD adapter for easy file transfer. The card is speed rated at Class 10, and leverage UHS-I technology to deliver a transfer speed up to 100MB/s (633x). These high-capacity cards give you the speed and space you need to capture, transfer, and share more adventures on the go.